UC Berkeley Student Senate Fails to Override Veto of Israel Divestment Measure | Democracy Now! AMY GOODMAN: We wrap up now with student activism. The student senate at the University of California, Berkeley, has failed to override a veto of a bill calling on campus officials to divest from companies that supply weapons that Israel uses in its occupation of the Palestinian territories. The measure targeting weapons manufacturers United Technology and General Electric initially passed on a 16-to-4 vote in March, but later UC Berkeley student president Will Smelko vetoed the measure. Three senators reversed their positions, and a final attempt to override the veto failed in a 13-to-5 vote early on Thursday morning. 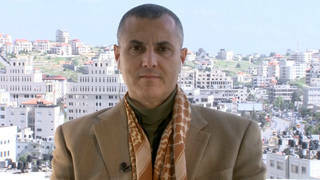 The case drew international attention, drawing support from prominent figures, including Nobel laureate Archbishop Desmond Tutu and independent Palestinian lawmaker Mustafa Barghouthi. Meanwhile, at the University of California in San Diego, the student council voted to delay its final decision on divestment. John Hamilton of KPFA filed this report from Berkeley. JOHN HAMILTON: It was nearly midnight on Wednesday before campus police secured a room large enough to accommodate the hundreds of people hoping to address the UC Berkeley student senate in a debate that stretched nearly 'til dawn. BILL SUPPORTER: As Jews, we support this bill, because it's the right thing to do, the moral thing to do, the nonviolent and just thing to do. BILL OPPONENT: Divesting from Israel will only cause further harm. BILL SUPPORTER: If divestment is hostile, then where do we begin to describe the hostility of a military occupation? BILL OPPONENT: The ASUC has become a platform from which to preach how evil Israel is. BILL SUPPORTER: The whole world is watching you and waiting for you to make the right decision. If you don’t, you will be remembered as the student senators who knew the occupation was immoral and illegal and still chose to stand idle and silent. JOHN HAMILTON: Students and community members were given ninety seconds each to address senators in a debate that often grew testy. BILL OPPONENT: Ask those to promote the measure and those who are here supporting it whether they want to see peace between a Jewish state of Israel and an Arab state of Palestine, and then decide whether you want to side with those who really want peace or with those who use methods like divestment to promote the same goal as Hamas and Mahmoud Ahmadinejad: a world without Israel. JOHN HAMILTON: Opponents of divestment spoke of the bill’s divisiveness and questioned charges that Israel has committed war crimes. BILL OPPONENT: If you buy into the allegation that Israel has committed war crimes, you are siding with the Palestinians on the Israeli-Palestinian conflict. There’s just no question about it. There has been — there has been no proof, no proof of these war crimes. BILL OPPONENT: The co-writer of the bill said, “These war crimes are real. They are well documented.” Oh, really? Is that why every democratic nation, both of our houses of parliament and our president rejected the Goldstone report, upon which the bill is based? JOHN HAMILTON: A substantial majority of those gathered at the senate hearing pressed for divestment. Leading the effort was the bill’s author and Berkeley graduate student Emiliano Huet-Vaughn. EMILIANO HUET-VAUGHN: The issue under debate is our university’s investments aiding war crimes and other human rights abuses committed by the Israeli military. And some critics of this bill continue to call into question the existence of these war crimes, ignoring the opinion of every major human rights organization out there. They use words like “alleged war crimes,” and they encourage their speakers to ignore substantive debate of the issue at hand and instead resorting to emotional appeals. But these war crimes are real, they are well documented, and this body needs to come face to face with them. PALESTINIAN STUDENT: My name is Layla [inaudible]. I am twenty-three years of age. JOHN HAMILTON: Senators heard a direct appeal from Palestinian university students in the West Bank, including Anan Quzmar, a campaigner at Birzeit University. ANAN QUZMAR: Some would argue that taking sides might alienate some students. In fact, your university has taken a side already. It’s supporting the side of the oppressor. It’s invested in a company that is supporting the Israeli occupation. And this must end. That is the neutral position. Your current position is not neutral. You’re on the side of the oppressor. I urge everyone to vote in favor of this motion, and I hope that many universities will follow. ASUC SENATOR: Be brave. You’re here to make a decision. JOHN HAMILTON: As the clock ticked towards 4:00 a.m., senators launched into a final debate over the divestment measure. BILL OPPONENT: I am, however, disappointed in the ASUC for considering an issue that is so complex and multifaceted that even the senators that began researching the context of this bill are not even scratching the surface of its meaning. BILL SUPPORTER: I’m kind of surprised, because we go to Berkeley. We’re like the number one —- supposedly the number one public university. We have all these classes, and it teaches us to engage in these complex issues. And so, I don’t know what you’ve been doing, but maybe you can come to class with me tomorrow. BILL SUPPORTER: I believe we need to divest and that we need to divest from these two companies, because it’s peaceful, but it’s still economically aggressive. BILL OPPONENT: Divisiveness is necessary in this case to pass this bill. Therefore, tonight, I choose to sustain the veto, because there must be another way to have all stories included in our victory. BILL SUPPORTER: Being a first-generation American on my mother’s side and a Jewish student with a family of Holocaust survivors, I am blessed in being given the chance to do right by my ancestors and my communities tonight to do the least that is asked of me to stand up for rights of the oppressed when I see the opportunity and to vote to divest, once and for all. Thank you. ASUC SENATOR: By a vote of 13-to-5-to-1, this motion to override the veto fails, and the veto is sustained. JOHN HAMILTON: After their efforts to override the presidential veto fell one vote short, senators led the crowd from the room in a silent protest. Organizers say it’s only a matter of time before UC Berkeley and other universities divest from companies that arm Israel in the commission of war crimes. They point to a similar bill under consideration at UC San Diego and other efforts on campuses across the country. For Democracy Now!, I’m John Hamilton at the University of California at Berkeley. AMY GOODMAN: This is Democracy Now!, democracynow.org, the War and Peace Report. And in our last minute, I’ve asked Professor Clayborne Carson of Stanford University, who has actually recently returned from the West Bank, to describe what you found there and why you went. DR. CLAYBORNE CARSON: Well, I went there to meet with Palestinian nonviolent activists. I’m interested in, obviously, nonviolent movements around the world and who are carrying on the King and Gandhi tradition, and I think the most vibrant right now is in the West Bank. So I was in Ramallah, Hebron, Jerusalem, obviously, and I had had a video conference with activists in Gaza, since I was not allowed to enter Gaza. AMY GOODMAN: And is there a boycott movement here at Stanford as there is at UC Berkeley? DR. CLAYBORNE CARSON: Yes, there is. I think that this is part of that educational work of this — the movement that’s going on is one of the most important nonviolent movements going on in the world, and yet news about it is not getting to the United States. And I think this is part of the effort to make it more visible. AMY GOODMAN: Professor Clayborne Carson, thank you very much for being with us, as we wrap up our broadcast today, as we leave Stanford University.